This entry was posted on Sunday, December 30th, 2012 at 12:48 pm and is filed under Blog. You can follow any responses to this entry through the RSS 2.0 feed. You can leave a response, or trackback from your own site. Wow, thanks so much for posting this! I have been enamored of Zooid ever since I first heard them live in Chicago, but their harmonic language has always remained obscure to me. I could be wrong, but Threadgill’s system sounds a bit similar to Steve Coleman’s cell notation, but with a greater emphasis on counterpoint. I’m eagerly awaiting the follow-up post, and, in the mean time, I’ll check out the rest of this wonderful blog of yours. Thanks for your interest! I just looked up Coleman’s page on cell notation and it seems to be basically “just” a more precise notation for chords (or transposable collections of pitches in general) and doesn’t imply any particular sort of process with them (e.g., he presents a “traditional” song in both chord-based and cell-based notation). 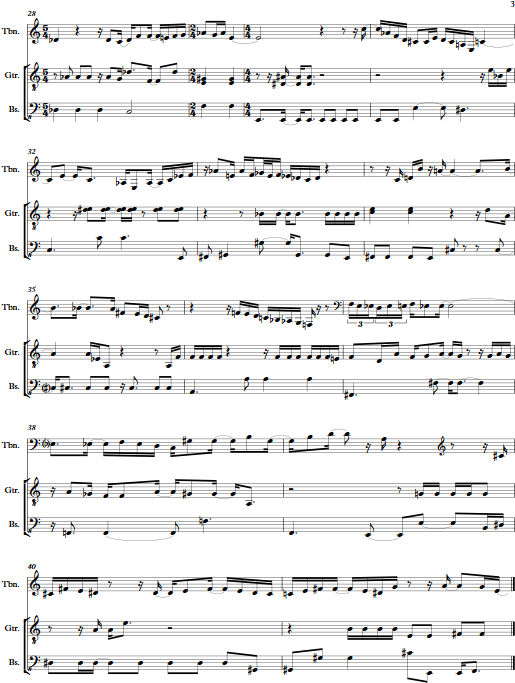 It sounds like that notation is a good way to express the data used in Threadgill’s system, though, so the scores may use it or something like it. The little I know about Schillinger just comes from the classical direction, where he seems to have been regarded as somewhat of a crank. It’s been interesting to find out that he’s been more influential in the jazz field. Thanks this is an interesting piece , f….. me you do have good ears ) its made me go back and listen to the piece in a new way. I’ve read back some interviews, Threadgill has talked about his intervallic system : is it possible to predict or say where the interval sets are changing and how often ? Listening to Zooid the music seems so seamless its hard to know, but from the solos there’s a definite logic. I look forward to more from your work. Since it’s been a while since this post I’ll take the opportunity to give an update that I’m up to the 8:00 mark (out of 8:40); I just haven’t posted any work in progress since. A lot of it was tougher than expected due to intonation issues. Lots of interesting stuff to report once I finish! I should mention that I’m a totally different Mark M….but super awesome work so far…I was wondering did you ever get any farther? I’d love to hear someone theorize a bit about what Mr. Ellman is up to in this context (horizontal vs. vertical). Sometimes to me it sounds as “simple” as him being someone that’s listened to a lot of M-Base-associated soloists like Coleman, Osby and Gary Thomas. And then he’ll do something utterly and structurally odd that connects explicitly to something else in the music…it’s all so nicely mysterious, I’m a little afraid that figuring it out will ruin that (;->). 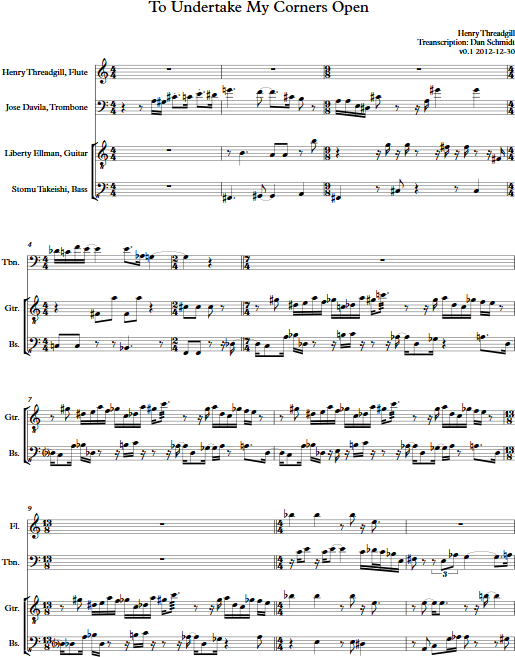 I’m still mere measures from the end, and have been for months, but the intonation issues have really gotten me down. If the flute is 30 cents sharp and the bass is 30 cents flat (say), then my attempts to transcribe both pitch and intervals accurately are kind of dead in the water. I’ll try to just soldier through, get all the notes down, maybe do one cleanup pass, then throw it out there as a baseline for future work. Many thanks for that shot of the score, that’s a really interesting clue! Please continue brother Dfan its still value-able work, I hope to see this great effort published soon. 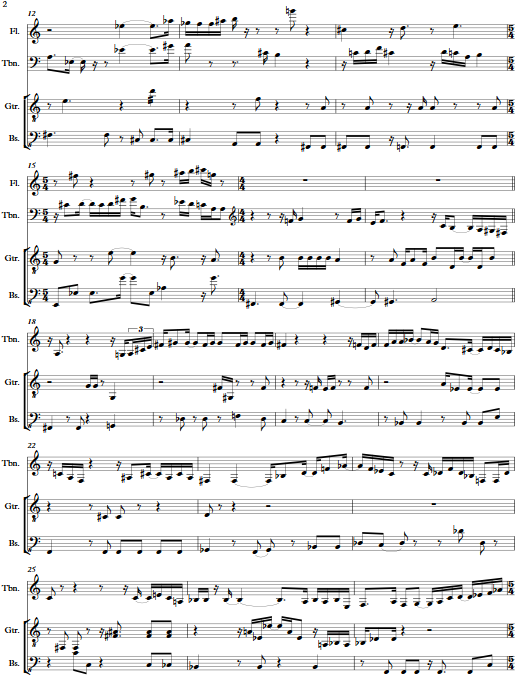 I tried using Transcribe but gave up the bass and trombone are so low its mush.